Fredrik Malmborg just posted an article (in Swedish) on his blog about how the Swedish government have been moving several departments (taxes, defence, etc) from an IBM/Lotus platform to the Microsoft stack. He noticed that a certain executive with sales responsibility for public sector at a big software company became Secretary of State (not the same as "Secretary of State" in the US) right before the government asked a certain software company (guess which one!) to write the specification for the new system. Coincidentally that same company (Microsoft) was then choosen to deliver the solution. IBM was never offered to even compete. A year ago Computer Sweden wrote (in Swedish) about several departments moving from IBM/Lotus to Microsoft, without IBM being allowed to compete, or in some cases select Microsoft despite IBM being less expensive. Google translation here. * Outlook is used privately by many users and thus have a higher acceptance. * The similar interface improves the user experience. I know that IBM does not believe in those arguments, but the customers and the ones in charge (may it be politicians, civil servants or a CEO) buy that argument. Line, hook and sinker… Especially if the persons in change are among the ones that use Outlook at home (since it come bundled with many versions of Office). I personally know several people who use Outlook (not Outlook Express!) at home for their private mail, as they can easily aggregate several mail accounts into one client. I been building/rebuilding a number of computers for friends lately, and the request to use Outlook came up several times. I believe that IBM should create a "IBM Mail" client, with support for POP/IMAP/SMTP as well as direct support for Gmail, Hotmail and Yahoo mail. Why not add Domino and Exchange support, to allow users to connect to work, without installing the full Notes client? The client must be able to aggregate mail from multiple sources, and send mail using any of those services. When you compose a new mail, there should be a dropdown where you select Gmail, your ISP service or Yahoo mail (depending on what you have setup), the same way as it works on most smart phones today. If you reply to a mail, the service is was received on should be default, e.g. if the mail was received through one of my Gmail accountrs, the reply should be sent using the same account. This client should look like Notes mail, contain a calendar, to-do, journal, perhaps an RSS feed and support for widgets. Why not throw in a couple of simple but useful applications? Show that "IBM Mail is not just mail". Strip away as much as possible when it comes to complicated menus, settings, etc. The properties/settings in the Notes client causes any normal user to get a headache instantly… Make it easy and quick to setup, and make it available as a free download, without any annoying registration. Most of all, make the client fast. The market perception will not change overnight, but in the long run, showing that "IBM Mail" looks modern and has the functionality people need will benefit Notes. 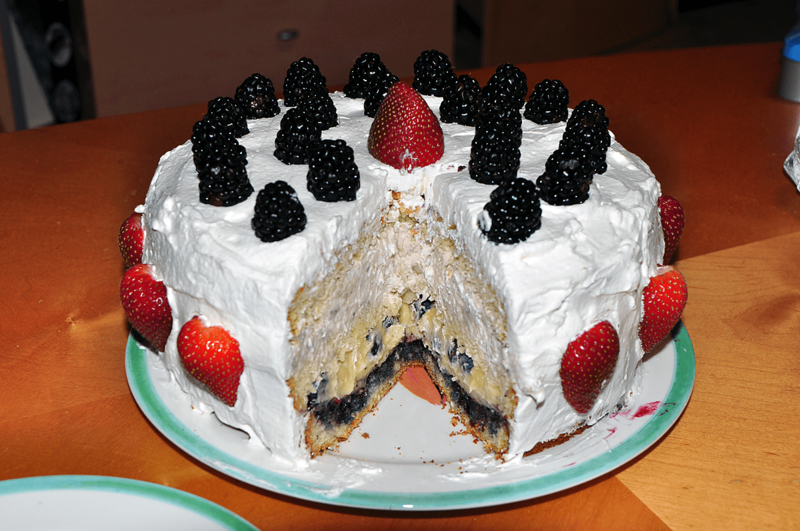 I wanted to share the recipe for the cake I made this weekend. It is very easy to make, and tastes great. Mix 6 eggs and 3dl (a little over over 1 cup) of sugar, beet it until fluffy. Mix 1.5 dl (9 tablespoons) flour and 1.5 dl corn starch (potato flour in Europe) in a bowl, add 3 tablespooons of baking powder and mix well. Fold this into the egg/sugar mix, stir gently until the batter is smooth. Cover the inside of a baking pan with butter and then breadcrumbs. Pour in the batter and place in the lower part of the oven. Bake for 40 minutes in 325 degrees F (175 degrees C). When done, turn it upside down on a cooling rack, let it cool down for a few monutes before attempting to remove the baking pan. Slice through the cake twice so you get 3 equally think slices. On top of the first one, spead a jam, for example blueberry jam. Pend the extra $2 and get the best one you can get, low in sugar and high in fruit. If you have an IKEA nearby, theu got several good jams to choose from. On top of the jam, put a 1/2 inch thick layer of vanilla creme. I make it from Vanilla Sauce powder from Sweden, but here is a way to make it yourself. You can add some fresh fruit here, if you like. Why not fresh blueberries, to complement the jam? Put the next layer of cake on top of the vanilla creme, then add another filling. I often mash 2 bananas and mix with whipped creme. Make sure the creme is nice and thick, it should be solid, not runny or soft. You can add fruit in here too, if you like. Perhaps chunks of fresh strawberries, they go well with teh bananas and creme. 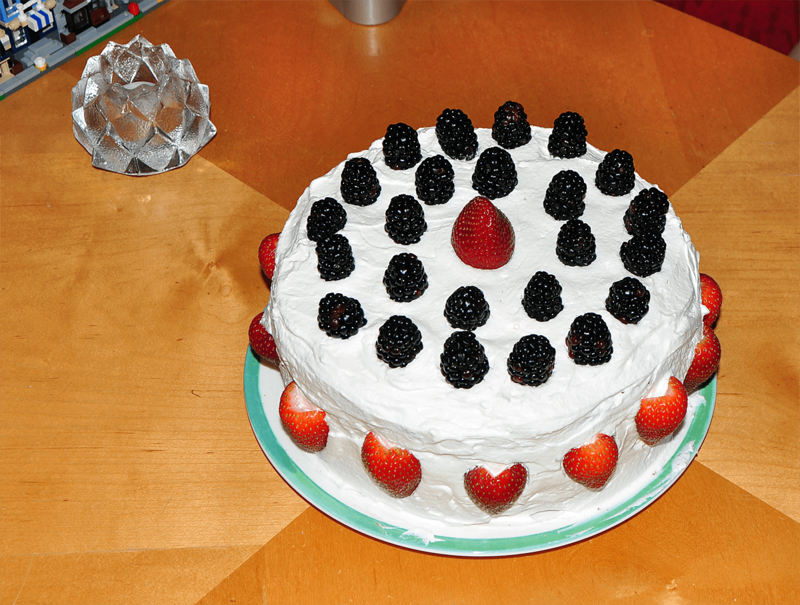 Add the last layer of cake, cover the whole thing with more whipped creme and decorate with fruit. Strawberries, rasberries, blackberries. Or why not go for a "mushroom cake", cut bananas in about 1.5 inch long pieces and place them standing up on top of the cake. Drain a can of apricots and put them on top of the bananas like mushrooms.